ID&T is a designerly education. In practice this means that: there are few traditional sit-in exams, but rather examination in the form of design projects, home exams and/or essays. Being able to present and discuss designs in both written and spoken form is crucial. Thus, there is a heavy emphasis on continuous feedback, often in the form of crits (i.e. design critique sessions where student present onging work and get constructive feedback). Most courses feature both theoretical and practical elements. Due to the latter, much time will be spent in school, working on different projects, both individually and in groups. Design tasks vary between being completely open (e.g. “Design something playful for a train station”) and clearly defined (“Take this board game and make a computer version of it“), but in all cases it’s all about design and interaction, meaning that there is not one correct solution, but rather several different approaches. The education takes place on Campus Lindhomen, mostly in Chalmers’ award-winning signature building Kuggen. On the second floor we have design studios, workshops (for woodwork, painting and electronics) and a classroom. Top left: Kuggen (Photo: Chalmers Image Bank). Top right: One of the workshops. Bottom left: The design studio High. Bottom right: Post-Its and whiteboards — two of our most used tools! The Interaction Design & Technologies programme is run by the Interaction Design Division at Applied IT, Chalmers University of Technology & Gothenburg University. 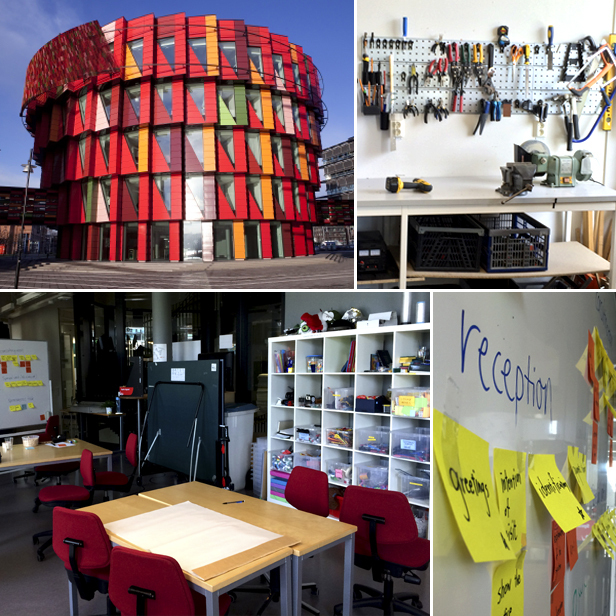 You’ll find both us and the programme class room and studious in the landmark building Kuggen on campus Lindholmen. Our research group consists of 15 senior researchers and ca 5 PhD-students. Our research interests include: Mobile Touch, Gameplay Design, Visualization, Designing for and with Children, Automotive design, Virtual Reality, and Touch and gestural interfaces.